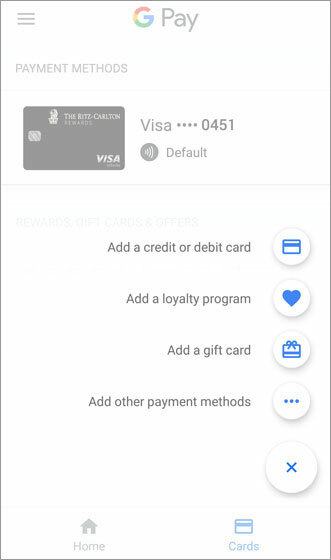 If you'd like to store a gift card in Google Pay, view this info. 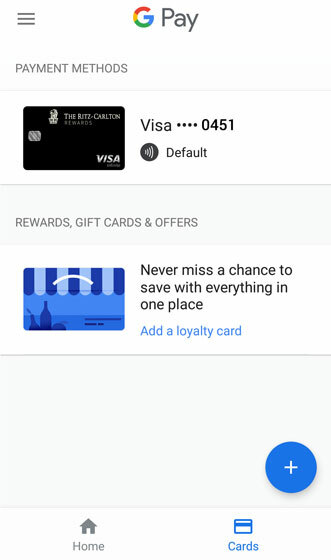 From the Google Pay app, tap the Add icon (in the lower-right) to add a card. For more info or to download the Google Pay app, haz clic aquí. Tap Add a gift card. Enter the name of the gift card then select the retailer from the list. Line up the bar code on the gift card in the photo viewer then take a picture. Alternatively, tap Add Manually then enter the required info (e.g., card number, PIN, etc.). From the Gift card screen, enter any appropriate info (e.g., Balance, PIN, etc.) then tap Save. To be notified when the card can be used nearby, ensure the Notifications switch is on . If necessary, tap the switch to turn it on.